Here are just 10 interesting work-at-home jobs that go far beyond data entry. If you thought that work at home jobs consisted mainly of administrative work and accounting positions, think again. Virtually any in-office job can be done, well, virtually! Here are just 10 interesting work at home jobs that go far beyond data entry. 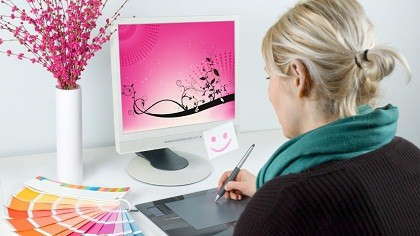 Many t-shirt companies hire artists to create design concepts. Often, there will be a specific focus such as typography or vintage-inspired looks. If you have a portfolio of art work in any medium, this may be a position to consider. An education writer creates math and language arts questions for testing purposes at the Kindergarten through high school level. Such a position suits you if you have an education background and strong writing skills. A medical review physician reviews medical information and makes objective determinations. If you have an active and unrestricted medical license, such a position would allow you to practice medicine without leaving home. Graphic artists create visuals for online media, customize photographs, design wedding invitations...the opportunities are endless! Adobe and Photoshop knowledge is usually required. Some companies hire investigators to gather background check information on those applying for other positions within the company. If you have a computer with Internet access at home, this may be the job for you. The work for contract photographers can include anything from model shoots and catalog product shoots to newspaper current events or capturing weddings. If you're a hobbyist photographer, why not try to earn some money from it? If you’re thinking of making the transition to working from home, you’ll find a wide variety of telecommuting jobs to choose from. So pursue your passion and you’ll find a job in the career field that interests you in no time!